We are delighted to announce the launch of our newly redesigned website for SFARI Gene. The updated platform features a streamlined user interface, new data visualizations, improved search capability and, most importantly, a continued commitment to the rigorous and thorough curation users have come to expect. Current estimates suggest that variation in several hundred different genes could affect susceptibility to autism. SFARI and other funding agencies are supporting efforts to identify as many of these “risk genes” as possible, with an eye toward understanding how mutations in these genes might affect brain development and result in the complex spectrum of behaviors that we collectively call “autism.” Given the scale of the dataset involved, there is a real need in the field for a trusted, comprehensive and dynamic database that catalogues all known information on these risk genes from the published literature and gives autism researchers immediate access to it. an annotated list of proteins with which the products of the autism risk genes are known to interact. All of this information is carefully curated by the team at MindSpec, updated quarterly, and offered with extensive links to the primary literature and secondary databases. Our goal in redesigning the site was to enhance the user experience, making it easier for investigators to navigate from module to module to find the information they want as quickly as possible. Along the way, we hope that this wealth of information will promote new hypotheses that can be tested in the lab. An interactive gene visualization tool that allows the user to get a genome-wide view of autism risk genes or select smaller regions of the genome to focus on. This tool provides at-a-glance views of autism risk genes, the number of publications on each and, crucially, the gene score for each. 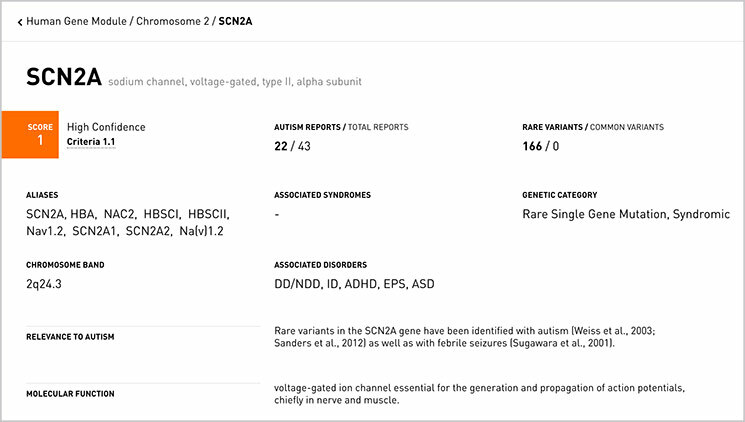 Additional filters can let users see the number of autism-specific publications for each gene, select particular chromosomes to focus on or select genes by the gene score they’ve been assigned. A redesigned view of all information collected on every individual gene. Clicking on a particular gene, either in the visualization tool or in the alphabetized table of genes, leads to a view of in-depth information about the gene that users will be familiar with, plus some new features, including a prominently placed gene score, one-click access to the explanation of that score and a history of any changes made to the score. 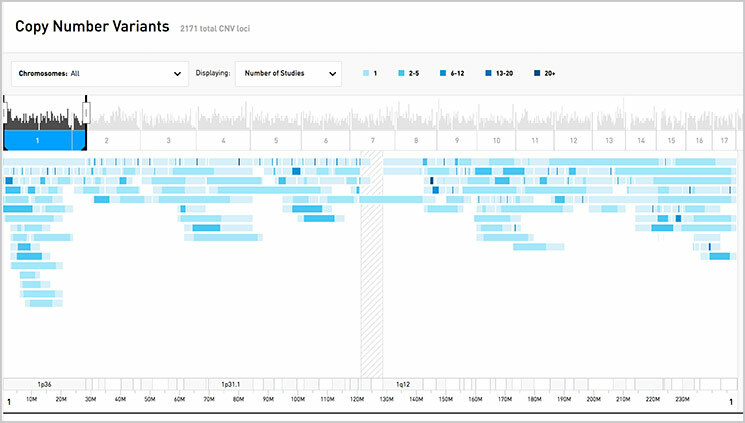 An interactive visualization tool for the CNV data, similar to the tool offered for the human gene information. This tool can be used to view the number of publications for each CNV, the number of CNVs at a particular locus and by status, as either deletion or duplication. High-level information for CNVs can be found by hovering over them in the visualization window or in the table below. Clicking on an individual CNV shows median start and end points for each, as well as the full population-level and individual-level data set, in a clear and readable format. An updated animal models module that includes all of the extensive genetic and phenotypic information about mouse and rat models relevant to autism that users are accustomed to, along with clear links to the human genetic evidence and examples of phenotypic rescues of each model. A protein interaction network (PIN) module that illustrates all known protein interactions that take place between gene products associated with autism. This tool can easily be filtered by gene score category and/or by the type of protein interaction. A ring browser that visually integrates all of the genetic information in SFARI Gene, including genes, CNVs, gene scores, and protein interactions. Such a module facilitates at-a-glance browsing of the data. The new navigation system and data visualizations are supported by advanced search capability, data download functionality, a glossary of frequently used terms and an extensively rewritten user guide. The news page will also feature summaries of the quarterly updates to the database, as well as summaries of recently published papers that use SFARI Gene data. We are gratified that SFARI Gene is increasingly cited in the primary literature, and we hope the redesigned version of the site will continue to be useful to researchers studying the genetic underpinnings of autism. We look forward to hearing your comments and feedback.